It goes without saying that acquiring mobile app installs is one of the most daunting tasks that modern marketers face in this digital age. In fact, while consumers tend to spend 90% of their mobile media time on mobile apps, a typical US smartphone owner uses an average of only 27 apps per month. All of this, in spite of there being a total of 2.2 million apps in the Play Store and another 2 million apps in the App Store. Adding on to that, according to a recent survey by Relevancy Group, marketers rated mobile apps as the fourth most effective channel for business revenue. So much so that it even surpassed traditional channels such as paid search and direct marketing. Therefore, it is not surprising that marketers all over are more than willing to invest huge amounts of money into driving app installs. According to Kenshoo mobile app report, the average cost per app install is somewhere around $2. Let’s say you run a QSR (Quick Serve Restaurant) that sells confectionaries such as doughnuts via the app and are able to convert about 5% of your users to place an order for doughnuts. At this rate, you need to make a profit of $40 per paying customer to be able to afford the amount of money that has been spent on driving installs. However, in most cases these kind of unit economics just don’t work in the favour of brands when it comes to paid ads. As a result, app marketers are often left out to rack their brains over new and effective ways to drive app installs. This is where Nearby Notifications come into the picture. Using Beaconstac you can now leverage Nearby notifications to trigger an app install to launch an app and perform a specific action. This allows users to tap on a Nearby notification, redirect them to the Google Play store and install the app in a single click and then launch the promoted feature directly on the app. Alternatively, you could even choose to redirect the user to a mobile web page of your choice (rather than redirecting them to the Google Play Store), if the app isn’t installed on his/her device. However, brands were still facing a number of hiccups when it came to making the most of Nearby Notifications. For example, Google’s Nearby platform doesn’t allow you to customize cards. You will have to first create a webpage or card, host it and then post the corresponding URL on the Google Nearby platform, under the beacon that will be transmitting it. 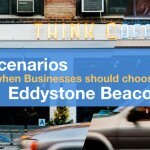 We recently published a blog that elaborated on how Beaconstac’s Eddystone platform simplifies all of this for brands looking to make the most of Nearby Notifications. In this blog, we will talk in detail about how to go about leveraging Nearby Notifications on Beaconstac’s Eddystone platform to drive app installs. The objective of this campaign is to help you grow the app business of your QSR outlet named ‘Mad over Donuts’ by sending out contextually relevant notifications that will in turn help drive mobile app installs. To enable this, we will deploy two Eddystone beacons, one at the entrance of the outlet and another at the billing counter in-store. When a consumer with a mobile device (that runs on Android 4.3 and above and has Bluetooth and location turned on) comes near any of these Eddystone beacons, he/she will receive a Nearby Notification that will ask him/her to install the app to skip the long waiting line and order ahead via the app. Before we begin, the first thing to do is to purchase two beacons. You can take a look at our Beaconstac platform, that includes everything you need to get started. Using Beaconstac you can set up your own Eddystone campaign, without a developer’s help – in less than 15 minutes! Once you have purchased the beacons, their details such as the UID-Namespace, UID-Instance and URL, will be added to the Beaconstac dashboard (by us) before we ship the beacons to you. After installing the beacon, all you have to do is click on the beacon of your choice, and navigate to the section titled ‘Nearby Notifications’. You can then go on to add a title and a description and list out the intent scheme and intent path (or the deep link that you want users to be redirected to) along with the package name of the app. Adding on to that, you can also provide a web URL as a fallback option. This way if the user hasn’t installed the app on his/her device, he/she can be redirected to a mobile web page which could elaborate on the features offered by the app. And we’re all set! Any customer who walks into your QSR store and comes within the range of any of these two beacons will receive Nearby Notifications on their mobile device in a manner similar to how it’s shown above. By clicking on this notification, he /she will then be taken to detailed view screen similar to the one shown above, on their mobile device. Clicking on the 1st notification will take him/her to your app’s Google Play Store page, allowing him/her to install the app in one click and launch the corresponding feature. Alternatively, if the user already has your mobile app installed on his/her device, clicking on the 1st notification (shown in the screen above) will directly take him/her to your app by launching the corresponding feature. 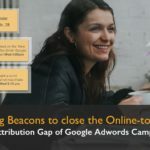 Hope you enjoyed making this beacon campaign with us! If you have any views and questions regarding this campaign, you can share them with us in the comments below. I am attempting to develop a proximity marketing business. I have registered beacons and can see them on my android devices with nearby notifications, but on my iOS devices the beacons are not visible, please advise. 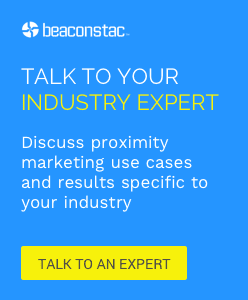 Do I need to register the beacons on both beacon tools for android and for iOS?